I came across this recipe a few weeks ago, when I first purchased Super Natural Cooking, a wonderful book by Heidi Swanson of www.101cookbooks.com. It looked intriguing. Apparently, this dish comes from a little restaurant near where Heidi lives called Pomelo. 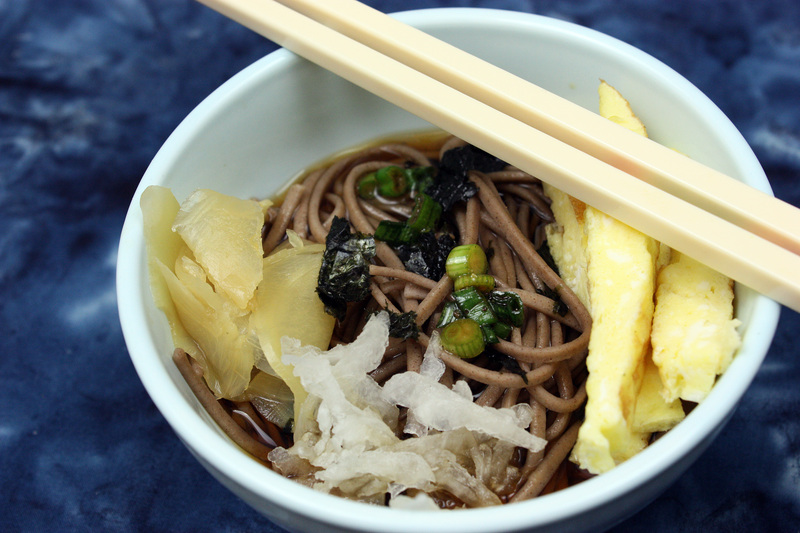 I love Asian foods (in case you haven’t already figured that out by my numerous Asian-inspired posts), but this recipe used buckwheat noodles, an ingredient I have seen in other recipes and in stores, but had yet to try for myself. And then, after reading Jaden’s version of the recipe on www.steamykitchen.com, and considering her suggestion to substitute shrimp for the tofu, I decided I was dilly-dallying around for too long, and I made a point to make it this week. And as usual, Heidi didn’t disappoint! I could eat bucketloads of this stuff. Seriously. I had more than my fair share for dinner last night, and I have packed a healthy amount of leftovers for lunch today. As you’ll see, on a last-minute whim, I added the sliced kumquats, only because I found them at the store that afternoon and had already gotten into them and was inspired. (Couldn’t help myself!) They make a unique contribution to this dish that I really enjoyed. Have you ever had a kumquat? If not, I highly suggest you try to find some. They are kind of like a Crybaby candy in your mouth. (Remember those?) You bite into them, and at first, they’re sour – like pucker-your-face-up sour. But then, the juicy, citrusy, sweet flesh on the inside gushes over your tongue, and floods your mouth with happy deliciousness! (Okay, so they’re really better than the candy, because they’re not artificial-tasting, but you get my drift.) You can find them in some Asian groceries, or at Whole Foods. I actually found them at Wal-Mart…a place I’m not usually shopping for produce…but there is a Neighborhood Wal-Mart on my way home from work that has a huge amount of Asian produce available. It’s rather unique. So when I happened by the kumquats, I grabbed them. So, without further adieu, I bring you Ostu, by way of Heidi Swanson and Jaden Hair, originally from Rolf Bachmann who I have decided is a genius to create this dish. To make the dressing, combine the lemon zest, ginger, honey, cayenne, lemon juice, rice vinegar, and soy sauce and blend in a food processor or hand blender. Run the blender for a few seconds, until all ingredients are combined. With the machine running, drizzle in the oils. While the noodles are cooking, heat up a large frying pan or wok. When hot, pour in the 1 T olive oil. Season the shrimp with a bit of salt and pepper. Once the oil is hot, add the shrimp in a single layer, and cook for 2 minutes. Flip over and cook until just cooked through, about another minute or two. Remove shrimp and set aside. Drain excess oil from pan/wok, remove from heat, and add the soba, cilantro, cucumber, and about ½ cup of the dressing. Toss until well combined. Add the shrimp and kumquats and toss again, and serve with sesame seeds and cilantro sprinkled on top. Serves 4. Can be served warm or cold. Years ago, I bought a Cooking Light cookbook, thinking I would make healthy recipes and they would be delicious. After attempting a few, I decided I didn’t really like Cooking Light recipes. Not sure if it was my lack of experience in the kitchen at the time, or perhaps Cooking Light has significantly improved their recipes, but now, they have some pretty good, simple, weeknight recipes available! This recipe came together in about 30 – 40 minutes. I did make some modifications, I added ginger and sesame oil, and omitted most of the sugar. I also didn’t add chopped peanuts at the end, but I probably will next time…I just didn’t have any at the house. This recipe makes 4 servings…the original recipe quoted about 420 calories per serving (which I couldn’t believe, it felt so filling!). Mine might be a wee bit more than that, with the addition of oils, but that tasty addition of sesame oil to me was well worth it! To prepare the sauce, combine the peanut sauce ingredients and whisk until incorporated. The sauce should be consistency of cream, add additional water if necessary. Cook the noodles according to package directions. Once cooked and drained, toss sesame oil with noodles to keep them from sticking to one another. Set aside. To prepare the shrimp, mix them with the ginger, cornstarch, and sprinkle a bit of salt and pepper. Let sit for a minute. Heat up a wok or large, deep skillet to medium-high heat and add the peanut oil. Once the oil is hot, add the shrimp, and spread out into a single layer in the pan. Let sit, untouched, for 1-2 minutes. Flip over and continue cooking until pink, another 3 minutes or so. Remove pan from heat. Add the sauce, noodles, bell pepper, and cucumber to the pan along with the shrimp. Toss to mix ingredients well (since the pan is still warm, this ought to warm up the sauce and noodles). 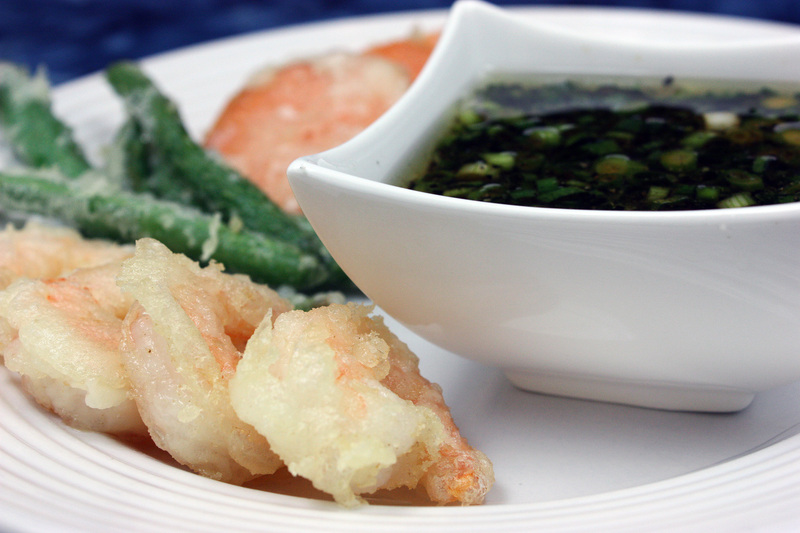 Serve sprinkled with green onions and cilantro, with lime wedges.